Partial view of the entrance to Camp Bowie, Brownwood, Texas, where the 7th Field Hospital was officially activated on 20 January 1943. The 7th Field Hospital was constituted by War Department Letter AG 320.2 (dated 30 December 1942) OB-I-SP-M, 25 January 1943, Subject: Constitution and Activation of Medical Units 1 January and February 1943, dated 5 January 1943, and officially activated at Camp Bowie, Brownwood, Texas, (Armored Division Camp; acreage 116,264; troop capacity 2,237 Officers and 43,247 Enlisted Men –ed) on 20 January 1943 with a cadre of 1 Officer and 26 Enlisted Men derived from the 12th Field Hospital. The Commanding Officer was Lieutenant Colonel Berthel H. Henning (who had served with the US Army of Occupation in Germany in spring of 1919 –ed). After being organized in 1914, Field Hospital No. 7 served in France during the Great War. The medical unit was part of the 3d Division Sanitary Train that trained at Fort Clark, Brackettville, Texas (Cavalry Post –ed) in 1917. It eventually served overseas in 1918 (together with Field Hospital No. 5, Field Hospital No. 26, and Field Hospital No. 28, plus their 4 corresponding Ambulance Companies. In the early summer of 1919, Field Hospital No. 7 was transferred to Andernach, Germany, at the Abbey of Lake Mary, operating an hospital as part of the medical support and service rendered to the Army of Occupation. Field Hospital No. 7 returned to the United States in 1921. In 1936 the unit was reorganized and redesignated Company G, 3d Medical Regiment. It was disbanded 13 October 1939. General view of Lake Brownwood, Texas. Lake Brownwood was a former CCC Camp closed in 1942 which eventually became a rest and recreation site for soldiers stationed at Camp Bowie. The State Park was also used for field exercises and other training activities. The 7th Field Hospital trained at Lake Brownwood, setting up bivouacs, medical installations, and conducting marches, hikes, and medical problems. The unit was to function in accordance with the mission of a Field Hospital as described in T/O 8-510 and consisted of 1 Headquarters Section and 3 Hospitalization Units (or Platoons), each unit capable of operating independently with minor changes in equipment and able to care for 100 patients. When combined the organization had a capacity of 400 patients, and could give a mobile Station Hospital type of medical care. It was assumed in theory that 20 Officers, 18 Nurses, and 190 Enlisted Men were required to enable the organization to operate efficiently. The personnel was given a vigorous training both in the field and in classrooms and in the Post Station Hospital, until it left Cp. Bowie for its Staging Area in New York. It should be noted that as literature on Field Hospitals was scanty at the time there was in fact no clear conception as to how such organizations were to function. Most of the literature prepared by the Medical Department was appropriate for training and functioning because a Field Hospital was supposed to operate as any military hospital. Training aids at Camp Bowie, Texas, were the usual training material of the Medical Department. During the period of training in the Zone of Interior, there was never a lack of field exercises. One of the most important ‘Medical Problems’ was conducted between 19 April 1943 and 6 May 1943 around Lake Brownwood, Texas. Some of the Basic Field Manuals used in training. They are from L to R: Basic Field Manual FM 21-5 “Military Training” dated July 16, 1941; Basic Field Manual FM 21-6 “List of Publications for Training, including Training Films and Film Strips” dated February 1, 1942; Basic Field Manual FM 21-7 “List of Training Films, Film Strips, and Film Bulletins” dated January 1, 1943. The 7th Field was instructed to set up a bivouac on a ridge in the area around Lake Brownwood (designated as Beachhead –ed), part of a State Park, which inevitably included some restrictions during operations. Trees or shrubs could not be cut down; wild flowers could not be destroyed, and sanitary precautions had to be implemented at all times. Moreover foxholes and trenches could not be more than 6 or maximum 8 inches deep, the use of artificial camouflage material was encouraged, and drivers were instructed to drive with caution avoiding to destroy shrubs or small trees. Preparation for Overseas Movement. Medical personnel on the gangplank ready to board ship. Picture probably taken at Camp Shanks, Orangeburg, New York (Staging Area for NY POE). Setting up and operating a Medical Collecting Station. Setting up and operating the Gas Section of the Clearing Station. Gas casualties were to be transported by ambulances from the Collecting Station to the Clearing Station. Enforcing all necessary Chemical Warfare precautions, including Decontamination of ambulances, personnel, and equipment. Decontamination of patients, vehicles, personnel, and equipment to be demonstrated in detail in the Gas Section of the Clearing Station, by “A” and “B” Platoons. First Aid treatment of gas casualties and loading of ambulances by “C “ Platoon. Details of transportation demonstrated by “A” Platoon, including Decontamination of vehicles and personnel of the Ambulance Section. Demonstration of Gas treatment in both the Collecting and Clearing Companies. Picture of RMS “Mauretania” which carried the 7th Field Hospital overseas. She left the United States the night of 11 September 1943, docking at Liverpool, England, the early morning of 19 September. The 7th Field Hospital including Headquarters and the 3 Hospitalization Units left for the bivouac area 29 April 1943, following lunch. The troops involved in the ‘Medical Problem’ field exercise first went through a roll call at 1245, and subsequently entrucked for the area at 1255 hours. All staff and personnel were instructed to take along full field pack, fatigues, raincoats, field jackets, leggings, and fiber helmets. At a distance of about 10 miles from the bivouac area, the personnel was ordered to dismount and proceed further under simulated combat conditions, with 5-yard interval, and some breaks. On reaching the designated bivouac area, a first aid post was to be set up at each Platoon bivouac area; trucks and ambulances were to be grouped in the motor pool; shelter tents were to be erected and foxholes outlined. The mess installation was sent into the area in advance; instructions for camouflage of the mess area, vehicles and installations were to be implemented; and precautions against possible air and chemical attack were to be rigidly enforced at all times. Apart from the fixed training program; a hike of 7 miles was foreseen, blackout driving and movement were applicable, sick call was to be held each day before supper, guards were to be posted around the bivouac at all times, night maneuvers were to be restricted to the bivouac area, swimming trunks or equivalent were to be carried as swimming instructions were foreseen in the field exercise. In between the various stages of the exercise, training films were projected to the troops. The first or basic period consisted of the preliminary training where the individual was followed, and where, at the end of the period, the trainee would be able to wear properly, display, and care for his uniform and personal equipment, and would understand and practice correctly indoor and outdoor military courtesy. He was also supposed to know the fundamentals of first-aid and sanitation, and possess a good knowledge of individual defensive measures and other essentials. The second period included more training with proper emphasis upon technical subjects, essential for further training in a Medical Department technical or administrative specialty, or further training in the operation and functions of a medical unit or installation. The third period was largely devoted to applicatory exercises in which the medical soldier applied his knowledge under field and simulated war conditions. Where practicable, he was then moved into the field to live under field conditions during a certain period. At the end of this period, he was ready to be able to collect and treat casualties, establish and operate an aid station during day and night, and set up the unit installation for operation in conjunction with the associated services. Whittington Barracks, Lichfield, where the 10th Replacement Depot was established. The site also had a military prison (infamous for its bad reputation). 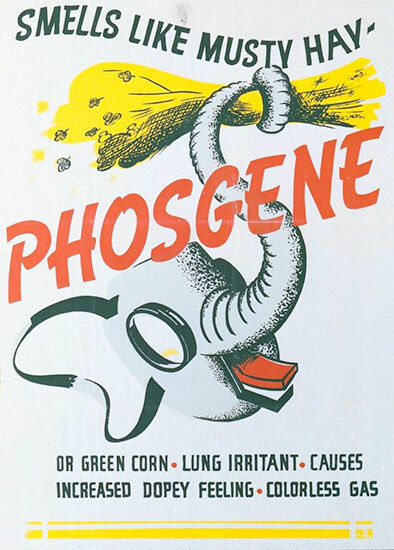 Chemical Warfare Poster, warning against Phosgenes (colorless respiratory irritant gas). The personnel of the 7th Field Hospital was given vigorous training in the field before preparing and leaving for its overseas assignment (training eventually continued on arrival in the European Theater of Operations –ed). The organizational equipment was medical field equipment including a large number of tents, both ward and pyramidal, so that everything could be sheltered. Fifteen (15) motor vehicles were included (4 ¼-ton trucks, 6 ¾-ton ambulances, 1 ¾-ton weapons carrier, and 4 2½-ton cargo trucks, plus the necessary cargo and water trailers). The standard equipment designated Unit Equipment Field Hospital (Item No. 97227) included such important items as 59 squad tents used to shelter patients, hold surgical facilities, and stock supplies; others included hospital and ambulance Geneva Convention Red Cross markers for use when camouflage was not required or impossible. 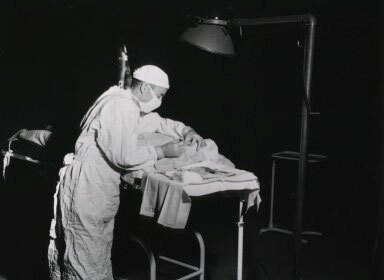 Each separate Hospitalization unit was equipped with two complete outfits for carrying out major surgery, including operating tables, lamps with generators, complete basic instrument sets, and a special set for genitor-urinary, neuro, maxillo-facial, orthopedic, eye, ear, nose, throat, and chest surgery, autoclave and hot water sterilizing facilities, surgical gowns, caps, masks, and drapes, and finally instrument tables. Each Unit had approximately 134 folding cots for patients, with mattress pads, sheets, blankets, pillows, mosquito bars, towels, straight litters and wheeled litters, and pajamas. Additional items included a complete x-ray outfit, equipped for fluoroscopy, horizontal and vertical exposures, which could be mounted on wheels for moving around the various wards for bedside pictures, and developing facilities as well as a darkroom. Moreover, each unit had a laboratory equipped with microscope, mechanical refrigerator, centrifuge, and the necessary materiel for routine blood and urine analysis and examination of smears, pus, feces, etc. Each unit was provided with its own mess for patients and personnel and enough compartmented trays for serving approximately 134 patients. The hospital had a small medical library. Its stores contained sufficient amounts of expendable supplies (drugs, surgical dressings, syringes, x-ray film, plasma) to last an estimated 10 days. In case of air movement, 10 C-47 cargo planes were required to move a single Hospitalization Unit without shuttling. Pheasy Estate Control Point building used by the Provost Marshal, Major Richard E. Lobuono. 24 August 1943 the 7th received orders to proceed to Camp Shanks, New York, where it arrived on 27 August following a very long train ride across half of the United States. It was here that the outfit was to prepare for overseas movement. After a seemingly long wait in the staging area, involving processing, issue of woolen clothing, and the necessary additional drill and marches, the unit embarked on the troopship RMS “Mauretania” on the night of 11 September 1943. During the sea voyage no mishaps of any kind incurred, although everyone on the ship was taught the quickest means “To Abandon Ship”, in case of emergency. On the morning of 19 September 1943 the 7th Field Hospital docked at Liverpool, England, where it was welcomed by a throng of people and a British Band which was partly caused by the German propaganda announcement that the ship had been sunk in the Atlantic three days previously. After debarkation, the unit proceeded by truck convoy to Govilon, South Wales (located in North Monmouthshire –ed), arriving there by 21 September. Other medical units operationg in the same area were the 29th Field and the 50th General Hospitals. Upon arrival, the organization was instructed to set up a hospital that was already constructed. Officers, Nurses, and Enlisted personnel went to work with great enthusiasm and in a relatively short time managed to clean the buildings, distribute the equipment and had the plant practically ready to receive the first patients, when it came time to hand it over to the 160th Station Hospital. This was nevertheless considered very valuable training because everyone now had received time to become familiar with ETO procedures and records. About 21 October 1943, the Hospital proceeded to Northern Ireland where it was temporarily attached to the 79th General Hospital at Waringfield, County of Armagh. After a period of a few days, the First Hospitalization Unit under command of Major Hyman Sneierson, MC left for Benburb, County Tyrone, a mere 7 miles from Armagh, to set up a 150-bed hospital. The site consisted of an old manor house, and a number of buildings in the village quartering troops. The place was equipped with British housekeeping material and American medical equipment and was in operation nearly two months admitting some 900 patients. Generally speaking, the facilities were considered adequate; bathing facilities and laundry were available, food and cooking were good, but the British-type kitchen was quite dingy and lacked some fresh paint. Sewage and waste disposal were satisfactory except for the plumbing which often required attention to keep operating. There was an adequate sterilizing plant for blankets, mattresses, and clothing. At the moment of arrival, there was neither welfare nor social service, but it was thought that in due course of time, a Chaplain and an American Red Cross worker would become available. Recreation consisted of movies, books, magazines, and games. Ambulatory patients requiring a longer stay and who were able to do so were required to assist in operating the Hospital by policing around their beds and assisting with the distribution of food. During its stay at Benburb, the unit’s professional staff was augmented by a surgical team from the 1st Auxiliary Surgical Group. On request of the Surgeon of the 2d Infantry Division, a practical theoretical school had been established and Officers and Enlisted personnel of the Division’s 2d Medical Battalion attended its courses. The group pertaining to this Medical Battalion consisted of 3 Officers and 42 Enlisted Men (in total training was given to 9 MC Officers and 110 EM of the Division –ed). When they returned to their organization, they were replaced by a similar group. Major General Walter R. Robertson, CG, 2d Infantry Division, expressed his satisfaction with the value of this instruction. Each week there was a scientific meeting attended by members of the command and by Medical Officers of the 2d Infantry Division. Since the formula proved efficient, the Hospitalization Unit further trained 10 ANC Nurses, 1 MAC Officer, and 20 Enlisted Men of the 10th Replacement Depot (occupying Whittington Barracks, Lichfield, which was also used as a US military prison under command of Lt. Colonel James A. Killian and Major Richard E. Lobuono –ed). Evacuation of patients from this Hospital took place by ambulance to the 79th General Hospital. The First Hospitalization Unit operated the hospital plant from 9 November 1943 until 8 April 1944 and cared for 3,564 patients during this period (operations: 245; anesthesias: 250; plaster casts: 150; x-ray examinations: 1271; laboratory procedures: 4408; and dental sittings: 1033 –ed). 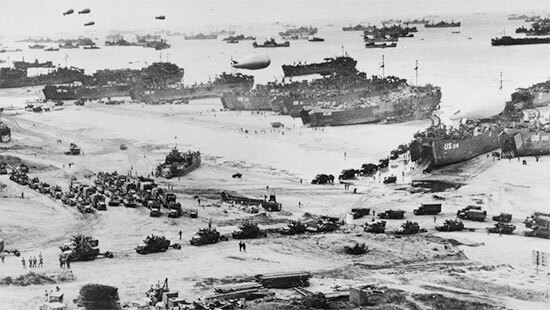 Partial aerial view of the build-up at Omaha Beach, Normandy, France, July 1944. Meanwhile Detachment “A”, 7th Field Hospital, under command of Major Henry Stibbs, MC was created by Letter AG 370.5, Headquarters, Northern Island Base Section, Services of Supply, ETOUSA, Subject: Movement Orders No. 8, dated 25 October 1943. 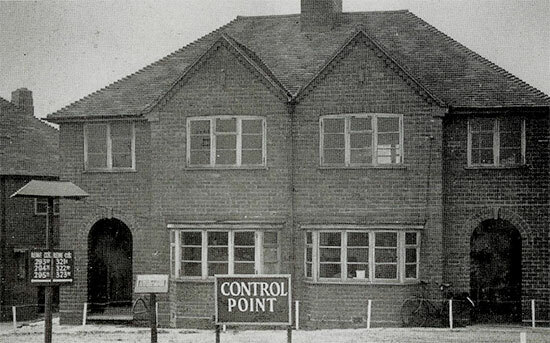 Detachment “A” consisting of the Second and Third Hospitalization Units was given the mission to convert a British Motor Camp into a functioning hospital. The work proved difficult as there were very few things available. This resulted in many improvisations. The camp situated at Clough, County Down, was destined to become a 200-bed hospital, and after a great deal of hard work, the Detachment was proud to open on 21 December 1943. As was the case for the First Hospitalization Unit, the Detachment was equally supplemented by a team from the 1st Auxiliary Surgical Group, and was divided into Medical, Surgical, and Dental Services. Between 22 December 1943 and 7 April 1944, this Hospital handled 1,996 patients (operations: 163; anesthesias: 148; plaster casts: 104: x-ray examinations: 907; laboratory procedures: 2018; and dental sittings: 1044 –ed). The organization was officially assigned to Advance Section, Communications Zone on 30 March 1944 (ADSEC, ComZ) as per Paragraph 5a, Letter Headquarters ETOUSA, dated 27 March 1944, File AG 322, Subject: Troop Assignment No. 41 (at the time the unit was already operating in the Northern Ireland Base Section –ed). During the above missions, the 7th Field was able to maintain its identity and keep track of its organic equipment by establishing the Headquarters Section (located at Benburb) as an independent entity outside of the two established Station Hospitals (see above). This arrangement made it possible for each Hospital to function without being concerned by the details of company administration and unit supply. The CO was able to divide his time as needed, traveling to and from the two Hospitals and rendering assistance wherever needed in order to keep things going. This was a wonderful and most learning situation and clear demonstration of the flexibility of Field Hospitals. It must be underlined that much was achieved in such short time. Because of limitations in personnel and space, no outpatients were accepted. For both units, evacuation was either to the 79th General Hospital, or to the 10th – 28th – and 317th Station Hospitals, in the command’s own ambulances, except that the RTO furnished transportation for convalescent patients to the 28th Station Hospital. On 15 April 1944 the 7th Field left Northern Ireland to arrive in Southern England (at Torquay, Devonshire) by 16 April. Here the unit split up once more, setting up separate hospitals. First Hospitalization Unit went to Hembrough to set up an independent 100-bed Station Hospital to care for troops in the area (they handled 200 patients, 51 outpatients, and conducted 67 treatments). Second Hospitalization Unit was sent to Brixham, to train and be prepared to receive casualties from the forthcoming Invasion of France (they only handled 24 patients, 32 outpatients, and conducted 43 treatments, since the expected numbers of casualties were never received, the men were also engaged in various duties on the hards, and treated the occasional road accidents victims as well). They set up a 100-bed Hospital. Third Hospitalization Unit traveled to Five Lanes, where it was to care for American troops stationed in the area (they handled 16 patients, 40 outpatients, and conducted 54 treatments) and operate a 100-bed hospital. Picture illustrating Surgeon at work in the Operating Room. In the same time it was expected for the units to gradually prepare for overseas movement to the European Continent. At completion of these separate missions, the First and Second Hospitalization Units plus Headquarters joined the Third Hospitalization Unit at Five Lanes, where they all departed for the Embarkation Area on 15 June 1944. The 7th Field crossed the English Channel on 29 June 1944, which was reasonably calm at the time and arrived off the coast of France, opposite Omaha Beach, Normandy, where it debarked 1 July 1944 (after spending the night aboard the Liberty Ship, which carried them to the Continent). Following assembly and briefing, the unit proceeded to Osmanville, France, where they were expected to establish a 400-bed hospital which did effectively open for patients on 10 July. Their mission was to treat patients received from ADSEC and to administer one of the medical transit camps near the beaches. The 7th spent some time together with the 5th General Hospital at Osmanville, while Engineers completed the new facilities at St.-Hilaire-Petitville where the 5th General eventually opened 31 July 1944. There was quite some excitement at the time due to the fact that it was believed the Germans had started to use gas (fortunately chemical warfare was never applied by either of the belligerents in the European Theater –ed). Luckily it just remained a rumor. Between 10 July 1944 and 15 August 1944, the Hospital treated 1,445 patients and 843 outpatients. The organization left Osmanville, France, on 16 August, reaching St-Lô the same day to relieve the 77th Evacuation Hospital which had seen previous service in North Africa, and now operated a hospital plant some two miles south of the city. During its stay at this new site, from 16 August 1944 to 29 August 1944, the 7th Field admitted 2,500 patients and treated 780 outpatients. In July-August 1944, a number of FFIs and civilians were treated both at Osmanville and at St.-Lô by the organization. At both places and in full cooperation with CIC, Civil Affairs, and French Government authorities, the 7th furnished medical care to persons in custody while being screened to ascertain their loyalty and collect further information. The 7th Field together with the 9th Field – 12th Field – and 28th Field Hospitals were used as Holding Hospitals by ADSEC during this period. While still operating at St.-Lô (where they mainly conducted reception, triage, and evacuation of FUSA casualties) the Third Hospitalization Unit received orders to move to the other side of the Cotentin Peninsula, near Coutainville, where it only set up one day before continuing on to Etampes, France, where it was joined by the rest of the outfit. As of 1 September 1944 the Hospital opened a holding unit at the local airstrip (A-52 repaired and prepared by the 833d Engineer Aviation Battalion, ready for operations 30 August 1944 –ed) where it handled a total of 1,489 patients and 340 outpatients (mostly French military and French civilians), eventually closing on 13 September 1944. And on it went, from Etampes, the 7th was ordered to proceed to another temporary airstrip at Rouvres, outside of Etain (A-82C repaired and prepared by the 926th Engineer Aviation Regiment + 825th Engineer Aviation Battalion, completed and ready for operations 10 September 1944 –ed). This time however, the organization was not only to set up a hospital but at the same time run a holding unit for a prolonged stay. Patients were received as of 16 September 1944. The men were joined by Company C, 93d Medical Gas Treatment Battalion sent in to help operate the installation. This was to become the unit’s longest stay due to the fact that there was still heavy fighting going on. Mid-November 1944 a unit of Army Engineers reported to complete the local roadwork; unfortunately there developed a delay due to lack of manpower and some engineering equipment. Meanwhile the Aviation Engineers who had repaired the airfield were now constructing a permanent loading mat for air evacuation. The mat was to be adjacent to the hospital tents and meanwhile the ADSEC ComZ Engineers were trying hard to connect the hospital roads to the airstrip road as fast as they possibly could. Because of the strain and the regular arrival, processing, and air evacuation of the many casualties and patients, support arrived in the form of 1 Officer and 45 EM belonging to the 726th Medical Sanitary Company, which somewhat helped relieve the situation (although another 45 men would have been most welcome too). Typical set up in the field illustrating Pyramidal and Ward tents as used by a Field Hospital (this particular picture illustrates part of the 10th Field Hospital). As far as evacuation of patients was concerned (in this case, specifically RAMPs), the 69th Medical Group, Third United States Army, had set up its own regulating station to watch the bed situation, planning to use a bed credit system for the 32d Evacuation – 34th Evacuation – 103d Evacuation – 106th Evacuation – and 109th Evacuation Hospitals to keep them from overloading the 7th Field Hospital. Among the incoming patients, there was an increasing number of trench foot cases, many of which were mild and should clear up in a relatively short time. Keeping the wards properly heated was not possible, additional stoves could be made available, but the lack of manpower and the limited coal allocations could not be solved at this time. Between 16 December 1944 and 28 December 1944 the holding unit held as many as 738 patients at one time, evacuating 624 in one single day. Both air and rail evacuation were available, and sometimes the numbers of air evac fluctuated. This was often caused by the lack or reduction in the numbers of ambulances, which made loading time double. It was frequent for the organization to help transient crews with coffee and sandwiches as many of them often stayed overnight. One day the 7th cared for a group of 43 Officers, Nurses, and Enlisted Men from a General Hospital who got lost; they were sent to the 103d Evacuation Hospital. During the major phases of the “Battle of the Bulge”, the period from 15 December 1944 until 13 January 1945, 2,565 patients were evacuated from the combat area to the 7th Field Hospital, with many of them receiving initial treatment from the unit. It was however not tactically possible to move any closer to the fighting because of lack of an airstrip for air evacuation in the area to which the organization was assigned to give direct support..
Operations, 7th Field Hospital. From L to R: Arrival of patients by ¾-ton Ambulance. Partial view of Dental Clinic setup. Nurses and Technicians at work in the patients’ ward. Practically on the eve of the German breakthrough in the Belgian Ardennes, an advance party (under the command of 2d Lieutenant John O. Thomas supplemented by 25 Enlisted Men –ed) left 13 December 1944 for the city of Metz in order to hold, clean, and recondition a set of five buildings (belonging to the “Ecole Nationale Professionnelle”) previously occupied by the Waffen SS, and temporarily used for billets by the 35th Evacuation Hospital which were to be converted into a functioning hospital. Meanwhile the Third Hospitalization Unit under the command of Major Norris W. Greenberg left Etain with orders to establish a small hospital at Denting, France (this was the “Johannes Bannberg Kaserne” –ed), outside of Boulay, to take care of RAMPs recently liberated by American troops. The total number of recovered Allied PWs reached some 2,393, and consisted mostly of Russians (1,361), Italians (615), and Yugoslavs (317). The camp where these PWs were grouped became exposed to enemy artillery fire and it was therefore necessary to evacuate all the RAMPs to Toul, France, which was achieved by 28 December 1944. From there on the Third Unit went to Toul (airstrip A-90, captured and subsequently repaired by the 826th and 840th Engineer Aviation Battalions –ed), where they set up outside the city in the “Adolf Hitler Kaserne”. They were eventually relieved by the 28th Field Hospital as of 10 January 1945. On 28 December 1944 the Third then returned to Metz to join its parent unit which was traveling from Rouvres, having closed their installations at Etain on 13 January 1945, during which time they handled 22,166 patients and 1,527 outpatients. It was expected that the Third Unit would inspect and prepare the buildings formerly occupied by the 107th Evacuation Hospital. All units were now set up and billeted at Metz, where the Second Hospitalization Unit opened a 100-bed Station Hospital 4 February 1945, handling almost 400 patients and 480 outpatients, and closing on 24 February 1945. While operating at Metz, new orders were received instructing both First and Third Hospitalization Units to entruck for Verdun in order to help support the 201st General Hospital which had just come over. The Third Hospitalization Unit set up a surgery room and dental clinic to assist the 99th General Hospital and the First helped and received patients together with personnel from the 101st General Hospital. The latter unit treated 88 patients before completing their mission and returned to Metz on 3 February 1945. The Third Hospitalization Unit was ordered to leave the 99th General Hospital and head for Montmédy, France, to find a temporary bivouac site to set up the 7th Field Hospital. Staying for only a few days, it was quickly ordered to go to Metz and rejoin the parent unit there. They left 31 patients behind who were transferred to the 61st Field Hospital (which would also relieve the men at Metz). Typical views illustrating building of different ALG airstrips in France, following the Normandy invasion and breakout. The work was conducted by the IX Engineer Command in charge of the numerous Engineer Aviation Regiments and Battalions. Metz, France was left 25 February 1945 with the unit now traveling to Bastogne, Belgium, to supplement the advance party which had already set up a small hospital in the old seminary. The main group arrived on site 26 February and opened the same date. They were only able to operate their Hospital up to 28 February 1945 at which time fire destroyed one of the buildings. Fortunately no one was injured and very little equipment was damaged, but during the fire fighting the remaining buildings were damaged so badly that the plant had to close. The number of patients handled was only 10, while 42 outpatients were received and treated. The 7th was now bivouacking for lack of suitable buildings, but new instructions followed soon. As a result the First Hospitalization Unit was dispatched to Niedermendig, Germany; the Second Unit went to help the 28th Field Hospital at Thionville, France, while the Third Hospitalization Unit stayed in reserve at Bastogne, Belgium, operating a dispensary. The Second Unit also took care of around 550 patients at Thionville. This was the first and only time that the 3 Hospitalization Units were operating in different countries, In this instance, France – Belgium – and Germany. Headquarters stayed with the Third Unit. On 17 March 1945 an advance party of 1 Officer and 11 EM were sent to Arlon, Belgium, to occupy buildings for a General Hospital. The Headquarters Section accompanied by the Third Unit now left Bastogne, Belgium, 20 March 1945 and went to join the First Hospitalization Unit at Niedermendig, Germany, where a 600-bed hospital and a holding unit were opened on 27 March 1945 (previously “Fliegerhorst Niedermendig”, built in 1938, operated by the Luftwaffe, captured by US forces 14 March 1945, taken over by the IX Engineer Command, and repaired and converted by the 830th and 834th Engineer Aviation Battalions, into an Advanced Landing Ground designated Y-62, ready for operations 17 March 1945 –ed). It was later reunited with the Second Unit which was also ordered to cross into Germany. Some reserve of white wine had been recently ‘liberated’ and was enjoyed by all or nearly all. The organization closed this hospital on 11 April 1945 having handled 1,753 patients and 60 outpatients. On 18 April 1945, the Third Hospitalization Unit, the Second, and most of the First Unit flew from Niedermendig to Kitzingen, Germany (previously Luftwaffe Training School and Air Base, built in 1933, operated by the Luftwaffe in 1935, seized by US forces April 1945, taken over by the IX Engineer Command, repaired with help of German PWs, readied for use as a resupply and air evacuation airfield designated R-6, repaired by the 819th Engineer Aviation Battalion, and fully operational by 15 April 1945 –ed), across the River Rhine to set up another hospital on an advance airstrip. At this point, the organization received a little publicity in the New York Herald Tribune, Paris edition, which read as follows: “The 7th US Army Field Hospital was flown intact in C-47 cargo transport planes from a site west of the Rhine to an advance airstrip more than 175 miles east of the river in the FIRST air movement of a hospital. The 7th Field Hospital thus became the most advanced Air Evacuation Hospital on the Continent. Survey of the new site was made by technicians of the Hospital staff 36 hours after it was cleared of enemy troops. Within three hours after the first cargo plane touched ground, the Hospital was ready to receive up to 65 patients. The movement required the transportation of 100 tons of technical, medical, and maintenance equipment.” (in fact 18 C-47s arrived at 1030 hours at Y-62 Niedermendig to move the Hospital unit by air; the first serial left at 1120 hours and by 1630 hours the 18 planes completed 2 round-trips to the R-6 airstrip at Kitzingen; 20 2½-ton truck loads of equipment and personnel remained and the last of this reached the airstrip on 23 April 1945; the 3861st Truck Company, consisting of 13 2½-ton cargo trucks brought one load while the remainder of the equipment was trucked to the new site by the unit’s organic transportation –ed). Typical line up of the 7th Field Hospital medical installations while in France. Upon reaching the site, it was discovered that the mission had been cancelled, whereby the group was instructed to bivouac at this location. Headquarters together with the remainder of the First Hospitalization Unit arrived by truck at the airstrip. An advance party had meanwhile already been sent out from Niedermendig to Andernach, Germany to set up on another airstrip. Orders then suddenly changed and they went to Weimar instead, to set up near airstrip R-7 (repaired by the 825th Engineer Aviation Battalion and ready for operation by US forces 14 April 1945 –ed). Another change of orders was received, so the unit now moved to Kitzingen airstrip R-6 instead. This group had the opportunity to see KZ Buchenwald and the atrocities committed by the enemy, before joining the parent unit again. At this last site, the 7th Field operated a dispensary and a small dental clinic handling only 12 outpatients. On 22 April 1945 the 7th Field Hospital received new orders and left Kitzingen by motor convoy heading for Bayreuth, Germany. The mission was once more to set up a 600-bed hospital and open a holding unit at airstrip R-26 which was done two days later (the airstrip was meanwhile still under repair by the 840th Engineer Aviation Battalion –ed). The evening of 22 April 1st Lieutenant M. L. Wear of the 538th Motor Ambulance Company arrived accompanied by the 8039th Medical Sanitary Company (Italian). Without this additional assistance the Hospital could not have started operating so expeditiously. The Italians seemed to work willingly and well. Around 0800 hours, 25 April 1945, the 476th Motor Ambulance Company arrived bringing in additional support. In the meantime Detachment “B” of the 726th Medical Sanitary Company was urgently transferred to the 58th Field Hospital at airstrip R-4 (repaired and converted by the 825th Engineer Aviation Battalion –ed) situated near Gotha using the 7th’s unit transportation. Between 24 April 1945 and 9 June 1945 the unit handled a total of 3,285 patients, and treated 769 outpatients. While stationed at Bayreuth, Headquarters, Second, and Third Hospitalization Units received orders to move to Cham on 31 May 1945 with the mission to take over the Displaced Persons Hospital currently operated by the 120th Evacuation Hospital, leaving the First Unit to operate this site on their own. After closing at Bayreuth, the First Hospitalization Unit did not join its parent unit, but instead traveled to Nürnberg, Germany, to continue air evacuation at the R-43 airstrip (repaired by the 834th Engineer Aviation Battalion after its capture by US forces –ed). Opening on site 13 June 1945, it was joined by its sister unit (Second Hospitalization) six days later. Their primary mission was to evacuate Russians to the Soviet Union (ex-PWs who fought with the German forces, and had been captured by Western Allied Forces –ed). Orders once more changed, and after evacuating only 700 Russians, the Second Unit returned to support the First Hospitalization Unit. While at Nürnberg, the First Hospitalization Unit handled 1,072 patients and 35 outpatients. The Third Hospitalization set up at Cham handled 1,350 patients and 90 outpatients, all of them DPs. After some profound reorganization all hospital staffs and working personnel were changed to German and Hungarian PWs while only a few American personnel remained in charge. All personnel from that particular period on were procured from available enemy Prisoners of War and civilian sources. The end of June found Headquarters and the Third Hospitalization Unit still at Cham, and the First and Second Hospitalization Units operating in Nürnberg, all in Germany. Additionally, the unit fed thousands of visitors and furnished shelter to hundreds of others, particularly Army Air Forces personnel. Cham and Nürnberg, Germany, were the last hospital sites operated by the 7th. Shortly prior to their last missions, the Hospital had been declared a Category IV unit, ready to be sent home. Special Service Guide, distributed by the Camp Patrick Henry, Oriana, Virginia, authorities. This was the Staging Area for the Hampton Roads POE. On 8 September 1945 the 7th Field Hospital received orders to proceed to “Camp Philadelphia”, some 20 miles from Reims, for redeployment to the United States. The entire unit traveled in “40 & 8” boxcars to their new destination, back in France, the country where they first began operating on the Continent. There were frequent stops, allowing the staff and personnel to eat at transit messes along the way. It was here that the unit’s Commanding Officer received an emergency furlough due to a sickness at home requiring his presence. After what seemed a very long wait, final alert orders came in on 3 October 1945 directing the men and women of the 7th Field to proceed to the “Calas Staging Area” in Southern France. Once again the entire unit traveled in the infamous boxcars. The organization now prepared for its return to the Zone of Interior and were ready for their last journey by 9 November 1945. The morning of 14 November 1945 the group sailed on the Liberty Ship SS “Newton D. Baker” (launched by Wainwright Yard, Panama City, Florida, 25 February 1943 –ed) bound for the United States. The first days at sea, quite a few cases of seasickness were experienced, but morale remained high, as everyone hoped for a quick discharge following the unit’s inactivation. When darkness fell the evening of 30 November 1945 the ship docked at Newport News, Virginia (important Staging and Replacement Center during WWII under control of Hampton Roads POE –ed) where she was welcomed by the authorities and greeted by a music band. A troop train was waiting to transport the staff and personnel of the command to Camp Patrick Henry (Staging Area for Hampton Roads Port of Embarkation; acreage 1,649; troop capacity 1,621 Officers and 22,916 Enlisted Men –ed) where the outfit was to be inactivated at 2359 hours, 30 November 1945, as per General Order # 119, Army Service Forces, Headquarters, Camp Patrick Henry, Oriana, Virginia. Postcard illustrating a marching band under the “Welcome Home” sign to Camp Patrick Henry, Virginia. The authors are still looking for a complete Personnel Roster of the 7th Field Hospital. Any additional data and pictures illustrating the unit are most welcome. Thank you for your kind assistance.